Caroline Young is a Chartered Legal Executive in the family team in Birmingham with over 20 years experience in all areas of family law providing clients with a bespoke service specially tailored to meet their specific needs. Caroline’s areas of practice include financial and children matters arising from divorce and relationship breakdown, such as resolution of financial matters to include preparation of consent orders or the issue of proceedings at court, applications for residence and contact. In addition she advises in relation to pre and post-nuptial agreements, and complex children issues involving abuse and parental alienation. Caroline is able to listen to the needs of her clients and offer pragmatic sensible solutions. 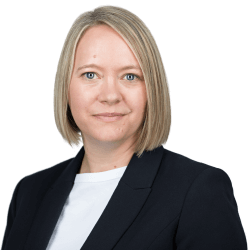 She is highly regarded by her peers being described in Legal 500 as “always having the client’s best interest at heart” and Chambers “certainly one to watch” “very professional and organised giving clear advice with a friendly and approachable manner”. Caroline is a member of Resolution and currently sits as Vice Chair on the West Midlands Regional Committee. Resolution promotes excellence in family law and the assistance of families to deal with family law issues in a non-confrontational way. Caroline is a Resolution Accredited Specialist Family Lawyer.